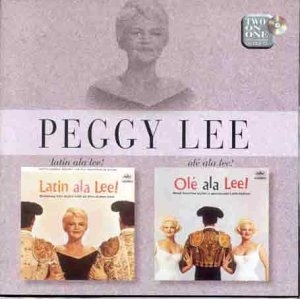 PEGGY LEE - Latin ala Lee! / Ole ala Lee! The two albums on this release were originally issued on CD in the late Nineties on Capitol as a twofer, two of three bonus were included in Peggy Lee Singles Collection. The Latin tinge in music has always been an ageless phenomenon from the early Spanish tinge to Bossa Nova and still continues to the present time. These two albums were popular when they were first issued on LP and have continued to be so over the years, this is not surprising has they contain some of Peggy Lee’s best work. “Latin Ala Lee” was the first album to be released and had an immediate impact, the opening track “Heart” received lots of airplays and became something of a hit with the general public. This was not surprising as it was completely different from what the public were used to hearing. There are many standout tracks including “Dance Only With Me”, “Till There Was You” and “Wish You Were Here” to name just three but there is a below track on the album. Having listened to this album many times it is difficult to imagine them sung in any other way, and this is a credit to Peggy Lee’s vocal talent and to the skill of the arranger, Jack Marshall. The second album to be released “Ole Ala Lee” is a much more subdued affair but it has its merits and a number of outstanding tracks. Peggy’s version of “Come Dance With Me” comes close to putting Frank Sinatra’s recording but not quite. “I Can’t Resist You” is a triumph which would be difficult to come up with better version of the song. “ You’re So Right For Me” is another which can stand a number of plays. The three bonus tracks are not really in the same league and can be really classed as novelty tunes but their inclusion is welcome if only for comparison. If do not already own these albums now is a chance to remedy that and I am sure you won’t be disappointed.